Mehmet Ersoy, who on Monday was named as the first Minister of Culture and Tourism under the new presidential system, is the owner of a tourism company that the Turkish government itself linked to the religious movement it blames for the July 2016 coup attempt, Cumhuriyet newpaper reports. The Turkish government’s accusations against ETS Tur, Ersoy’s company, were brought to the agenda during the trial of Cumhuriyet journalists in 2017, when phone calls they made to the travel company were used as evidence that the journalists had been in contact with the Gülen religious movement, which is accused of orchestrating the coup attempt. The government says an investigation into the company had been opened in 2014, and convicted several journalists from Cumhuriyet, a rare critical daily newspaper in a media landscape almost entirely under the ruling Justice and Development Party (AKP)’s control. “Apparently I called a well-known travel agency with full-page adverts many papers to book a three-day holiday to Bodrum. This call was deemed to have been contact with a terrorist organisation, and used as evidence against me,” said Musa Kart, a cartoonist from Cumhuriyet who was convicted to four years in prison on terrorism charges. “I was hoping for a three-day stay in a Bodrum hotel with a sea view, what I got was nine months in Silivri prison looking at concrete. This isn’t something you can just pass off as a booking error,” said Kart, who is free pending appeal after his sentencing in April. The investigation, however, appears to have done no damage at all to the company’s owner, Mehmet Ersoy, who was named as the tourism minister by Turkish President Recep Tayyip Erdoğan in Monday’s ceremony. 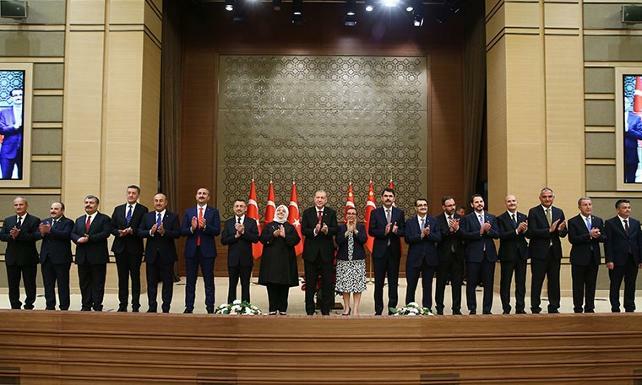 Ersoy will be joined on the cabinet by Bekir Pakdemirli, the new Minister of Forest and Water Management, whose brother was taken into custody for alleged links to the Gülen movement. Over a hundred thousand have been jailed or dismissed from their jobs due to alleged links to the movement under a two-year state of emergency in place since shortly after the coup attempt.